After nearly 10 years in my dream job, I’ve done lots and lots of weddings and events. I’ve met so many amazing people and have so many incredible memories, but sometimes, something – or someone blows me away – or renders me speechless. Or moves me to tears. Or makes me laugh out loud (even more than normal). I thought I would share a few of them with you. This is Carol. She is beautiful and vibrant and funny and deeply loved. She also has Cerebral Palsy. This wedding was all heart- from start to finish. I saw the best and the kindest of humanity, that day. 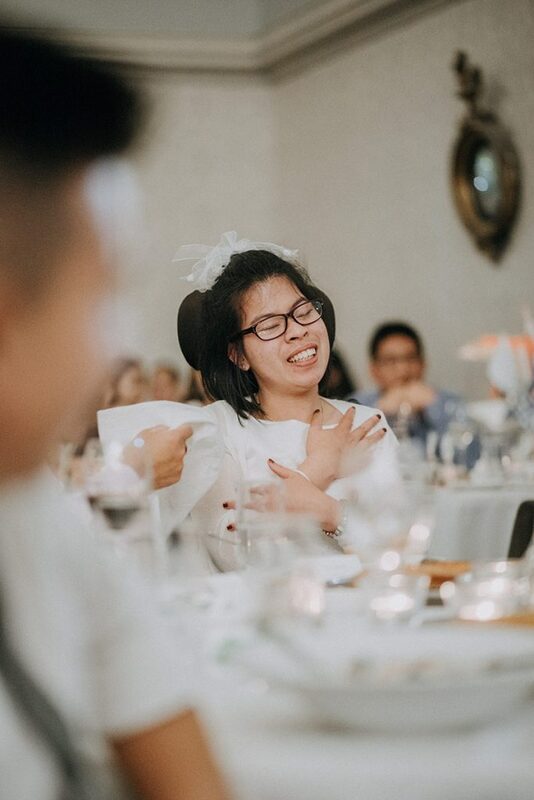 The music began and Carol was pushed down the aisle in her wheelchair – beaming ear to ear – by her brother – a beloved and honorary bridesmaid. She laughed and she cried from the front row. I observed the most incredible grace and compassion from her – and towards her – from everybody. In an age where people still – sadly – see difference as the uneasy unknown, I was moved and delighted to see the way that everyone rallied all night to include Carol in everything. Nothing was ever too much trouble. Or different. Or awkward. Could Carol see ok? Let’s get Carol on the dance floor! As the mother of a special-needs child myself, I wanted to hug them and collapse in a fit of grateful tears. This is the moment that Jonathan – in his speech – told everyone that he had always wanted a little sister – and that “Carol – I’m so glad I have you”. If ever there was a wedding moment that epitomised beauty for me, it would be this one. The most emotional Father of The Bride moment – ever. I have asked hundreds of Dads (and mums) for their wedding day blessing, over the years. I have never seen it as a passing of ownership, or anti-feminist. I don’t see it as a “giving away” because that’s ridiculous – who would ever give away their daughter? For me, the tradition is simply an opportunity to honour the relationship between them all – and the love they share. I have seen dads delighted and excited, and always proud as punch. I’ve seen some that jumped out of their seat, some that struggled with English, but smiled, instead. I thought I had met every kind of dad – until I met Sandra’s lovely dad, Gary. Just as I normally would, I asked him for his blessing; to tell us that he believed in the love that Greg and Sandra shared. And then it happened – he teared up – and started to sob. He was so overcome with happiness for his only daughter that once he started, he couldn’t stop. Sandra started crying then – and I encouraged her to go over and give her dad a hug. Now they were hugging and Greg’s eyes were misting over and I would be lying if I told you that I didn’t tear up, too. 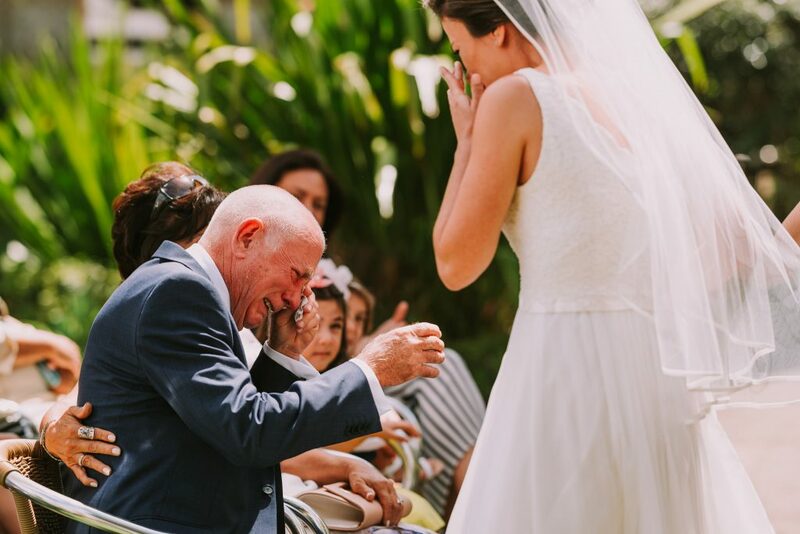 It was the most beautiful crying love fest ever – and this is one of the most beautiful wedding photos I have ever seen. Last year, a simply lovely – but quite shy – couple in the UK, contacted me about their elopement. Nicky and Ron were coming to Sydney for the holiday of a lifetime – would I marry them? Of course! I gave them homework for one of my Secret Ceremonies – and asked them if any of their friends and family would like to send a special message for them? I would read them as part of the ceremony. I was flooded with messages of love and offers of support. The day came round – the hottest, most un-British-traveller-friendly weather possible. It was almost 40 degrees – and I was grateful that our tiny little wedding would not begin until 5pm. 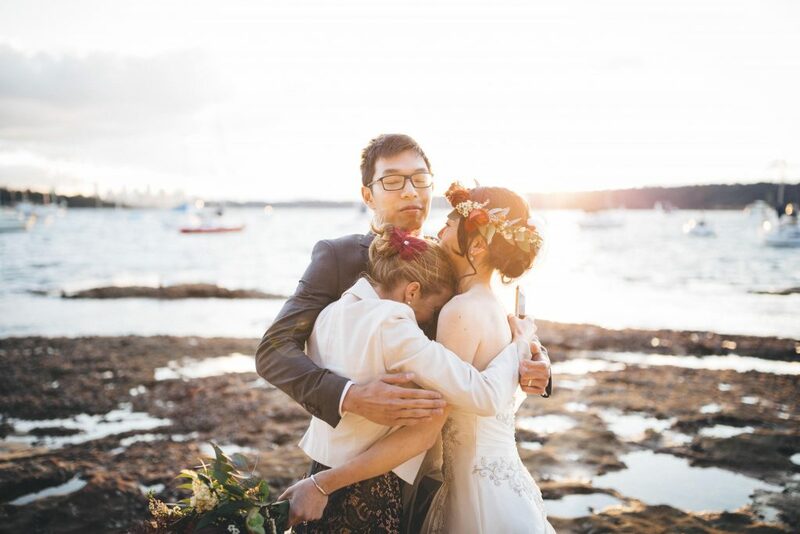 But then – it happened – the wind picked up – the temperature dropped 20 degrees -in about ten minutes and our beautiful little wedding by the harbour, at Captain Henry Waterhouse Reserve at Kirribilli, was about to be ruined. The photographer, my dear friend Nattnee, and I jumped into her car – and started looking for a new location, out of the gale force winds. We went back and found Nicky and Ron, looking very lost and very worried – and we packed them into the back of my car and drove to Wendy Whiteley’s Secret Garden. 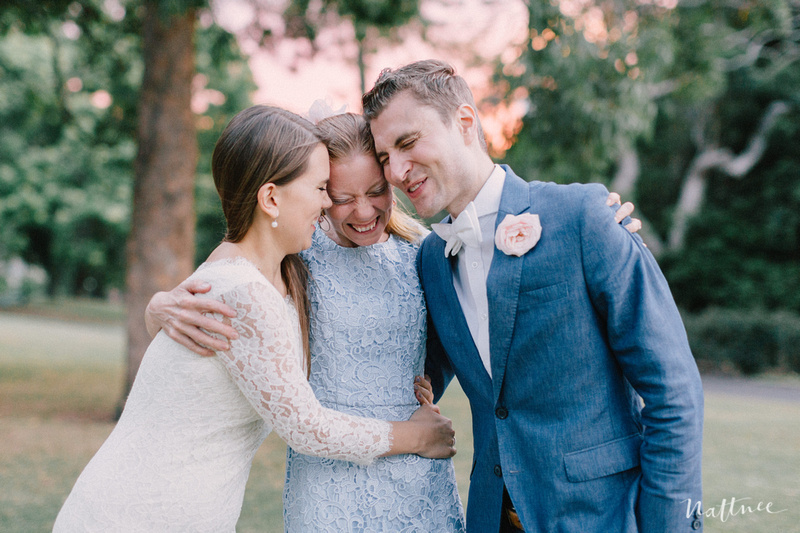 The ceremony itself was beautiful – in a way that only an elopement can be. We all laughed – and cried (even me) – and at the end, I started to read all of those messages. I had more than 10 of them. And 1 song. One of Nicky’s friends had written them a song- to the tune of a Christmas carol. Eight choruses…..
There’s just about nothing I won’t do to make my couples happy. I certainly wasn’t going to let them down – or their dear friend that had spent so long writing it. I couldn’t just read it. I thought – ok – here goes – and I sang…. It’s Ron and Nicky’s wedding! All eight choruses. Every single one. 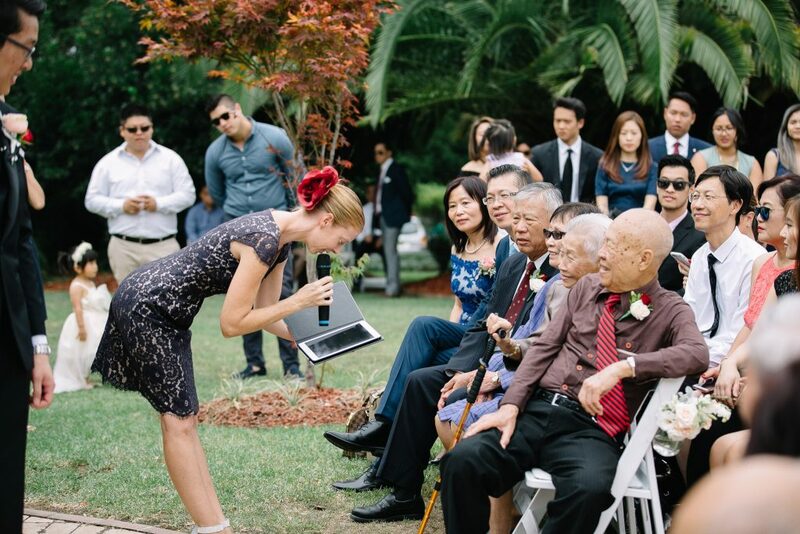 It is always a special thing to have a grandparent at a wedding – and I try always to make a fuss of them. In Asian cultures, in particular, the elderly are the most revered, most honoured and most precious guests. I try always to address them in their own language – and let them know that their presence is so important – and appreciated. This wedding was a stand out, though. At Aimee and Ray’s wedding, there were 7 grandparents. That’s the most grandparents I have ever had at a wedding. They all had different names – Ah Ma, Ma Ma, Po Po, Ah Gong, Gong Gong. Half of them spoke Mandarin – the other half spoke Cantonese. I wanted to welcome each one, individually, in their own language – by name. It ws never going to be easy – I walked around for an hour before the ceremony saying (in my head) Po Po is in purple – she speaks Canto, Ma Ma is in green, Ye Ye is in mustard – he speaks Mandarin – over and over again. I did it! – and as I did, I saw Aimee and Ray’s parents look at them – and at their own parents. They were literally swelling with pride. They’ll never know it was my idea. They’ll never know how worried I was about getting it wrong. They were so proud. “My Parents Won’t Dance” – Oh Yes They Will! For many of my couples, my TLC does not end with the ceremony. More and more, they ask me to be their MC, host, co-ordinator, hand to hold – everything – all night long – and I have to say, I love it. What I hear all the time is “my parents don’t dance” and “you’ll never get my parents to dance in” or “I bet they won’t”. I just nod and say “we’ll see – you wait”. What I have learnt is that everyone needs encouragement – and sometimes, a little inspiration and someone to follow – so I lead my receptions from the centre. I don’t just stand there and tell them what to do and then disappear. If I want them to dance, I’ll dance too. If I want people to get excited and energetic and embrace the party, then I better show them how. 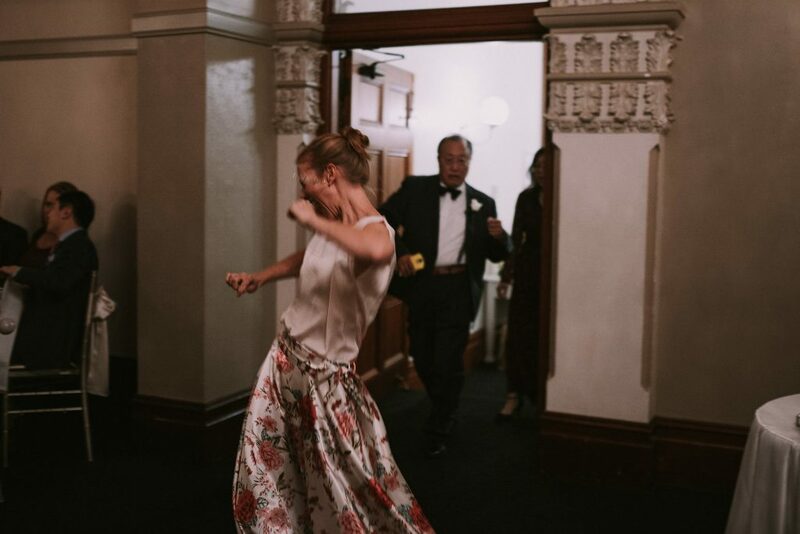 Take a look – right there behind me is Dad- bouncing his way into his daughter’s wedding – with all the energy and excitement in the world. And mum? She hit the dancefloor with me – all night long. She loved it – and so did everyone else. I love pets at weddings. I’ve certainly seen a few puppies in tutus and bow ties. A rabbit dressed up in a suit. Many an impromptu animal visitor – and some very cheeky birds. At this wedding at The Grounds of Alexandria, I had 4 bridesmaids and a dog ring bearer. Usually, we keep a dog on a leash – for just in case – but this one was very well trained – so, no leash. Just at the moment that I called for the rings, we had a visitor. 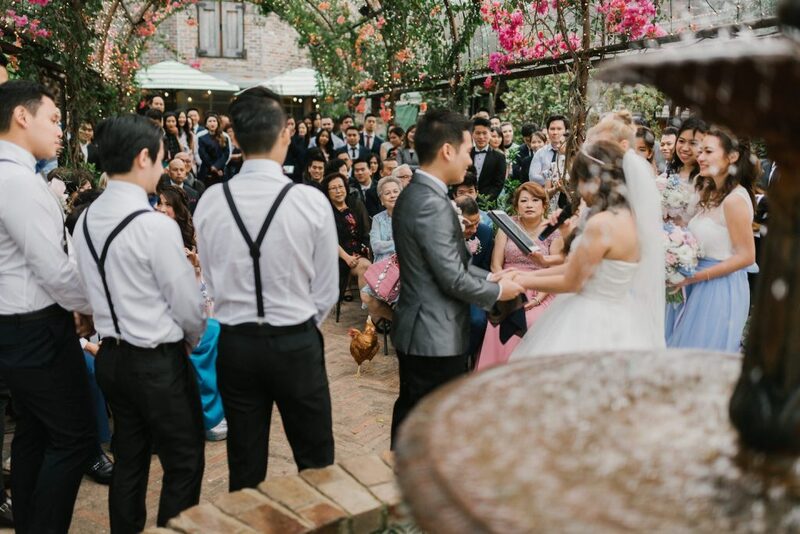 A chicken – waddling happily down the aisle. The dog went racing after the chicken. I went racing after the dog – and the rings – laughing all the way. Sometimes it’s the things that go wrong that make a moment so memorable – and sometimes, even better than it could have been without. I knew, at that moment that nobody would ever forget this wedding day. I will never, ever forget this chicken. I don’t have a photo for this one – and even if I did, it wouldn’t be right to post it, because Lou is no longer with us. When Robbie and Lou contacted me about their wedding, Lou was dying. She had horrible, untreatable ovarian cancer and was in palliative care at St Vincents. It was her dying wish – and his – that they marry before she passed away. I went to visit them at the hospital and although they were planning for a few weeks in advance, knew I didn’t have long. I spent hours with Lou, by her bedside. She told me everything. We hugged a lot. I knew that their plans for an out-of-hospital wedding, were less likely every day. I was right. The one month wait for paperwork was too long. I rang BDM and told them what I wanted – and that I would do it anyway – even if they said no. They said yes. Family and friends flew in from all over the world, for what was one of the most beautiful, moving ceremonies of my life. In the hospital garden, on a warm, sunny August day, Lou married the love of her life. She managed to walk the aisle with her parents. She and Robbie sat for the ceremony. At times, I perched myself on the floor, wanting to be on the same eye level; never wanting to look down on them. Photo and video hid in the bushes, not wanting to be intrusive. We kicked cancer to the curb. We laughed. Oh, how we cried – happy tears. We celebrated. The sun sparkled. The sky was clear. There was so much love around them both that if it were a fairytale, she would have been cured, brought back to life. Two weeks later, we were reunited as I performed her funeral. Lou was 29 years old. Gone – but never forgotten. There are no words to describe the day that Engleman married Lucia at Watsons Bay under the fig tree. None for how incredibly icy the wind was. None for the way it was blowing me off my heels and my iPad out of my hands. Or for the looks on the faces of the guests as the gusts blew straight into their eyes. Perishing comes to mind – but even that doesn’t come close. I’m a trooper. I’ll suffer in silence for the sake of your photos. I’ll go without a jacket – even if it’s 12 degrees – if your bridesmaids are in chiffon. I’ll do my best to avoid my teeth chattering into the microphone. On the flip side, I’ll melt in the sun, stand in the rain – and endure just about anything that Mother Nature throws our way to make you happy. But on this day, it was hard. Even harder than usual. This photo was not my normal post-ceremony hug. This was the three of us, huddled as close as we could, doing our best to grab whatever warmth we could -while we said good-bye. I tell you what, our photographer, Ann Marie Yuen is actually a magician. Somehow – and I have no idea how – she turned our icy smiles into rosy cheeks. Proof – you need a great photographer. Some goodbyes are harder than others. This is Eliza. She was the kind of bride that brings flowers to thank me for everything – even before the wedding day, itself. The kind that wore silver cowboy boy boots underneath her dress.The kind that trusted me 100% to bring the magic – and make her wedding to James amazing. It really was. In the beautiful barn at GrowWild Wildflower Farm, surrounded by flowers and the prettiest, brightest pompom garlands strung from the ceiling. Her bridesmaids in clashing floral patterns. Her grandma, beaming from the side, where I was able to pull up a chair next her – mid-ceremony – just to tell her how much it meant to have her here. Every minute a joy of laughter and tears – for everyone. And when it was all done – we hugged and hugged – and Eliza told me ” I promised myself I wouldn’t cry”. And then, we cried. I ask every bride and every groom to give me 15 minutes of their day – before the ceremony. Give it to me – and I will give you back a more relaxed experience, better photos, better video – and the knowledge – without any doubt – that I got this. I also know – that none of us really know how you will be feeling. Excited? Nervous? Terrified that you might trip over your own feet? All of the above? Sometimes, it’s all so incredibly overwhelming. Time is our friend. I’ve held a lot of hands, hugged a lot of people, whispered a lot of quiet reassurances, and sometimes, made a little bit of a fool of myself – just enough to break the ice and get a giggle. I’ll never forget Aimee. 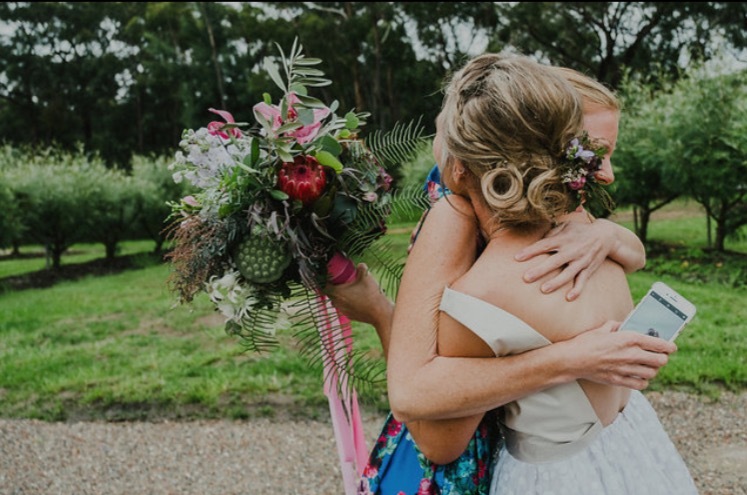 At Oatlands House, up in the bridal room, while Ray waited downstairs for his bride, we were hand in hand, head to head, me – down on my knees, she, still in her slip -deep breathing in and out. Not the slightest bit worried about marrying her lovely Raymond. Just terrified to walk down the aisle and have everyone looking at her. It is in these moments where I feel some of the most gratitude. I feel grateful for their trust. Grateful to be there to share these life-changing times. 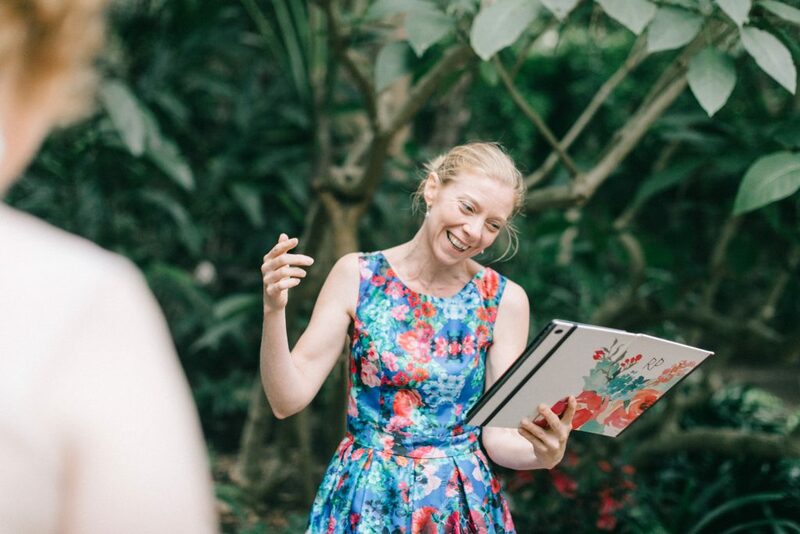 Grateful that somehow, amongst the many, many celebrant heads to choose from, that they stumbled across me – and saw in me, something safe and reassuring. For in those moments, I am the most of myself. I do my best work. The kind that almost nobody ever sees. Vaiva and Serge came all the way from Europe for their beautiful moment. This was really a case of ceremony-is-everything -and of everyone pulling together to make it happen. First there was a problem with their holiday visas. That caused them to miss their flights. They would miss their own wedding day. We changed our diaries. Their trip to Sydney was fly in, get married, sightsee and soak up the sun for 2 days, then fly out to Melbourne. Time was tight. What was going to be a 2 day mini-break became fly in, in the morning, get married at sun set, fly out in the morning. It sounds crazy busy rushed – but it wasn’t. In fact, it was one of the loveliest weddings I have ever done. Just me, my friend Nattnee as photographer / witness and our friend Russell as guitarist/singer/ witness – and Vaiva and Serge. They arrived – looking amazing – in the Botanic Gardens with champagne and the biggest bowl of enormous strawberries I have ever seen. Russell played. They slow danced. We laughed. We all cried. They danced some more. Nattnee snapped away quietly, not getting in the way, not directing them – just letting them be in their own little bubble of love. The sun was going down – and there was nobody else to be seen. The ceremony, itself, was a secret. I had given them some homework and used it to write what became a beautiful conversation between us – about their favourite memories and what they loved and admired about each other. It was magic. At the end, we ate strawberries and drank champagne – all five of us – as though we had known each other forever. In a way, in the way that beautiful memories never fade, we will. Sione & Prashani were cooler than cool. Years and years before her time, Prashani wore a white pantsuit for the ceremony – and looked amazing. Her brother was her Bridesman. Not a suit to be seen. 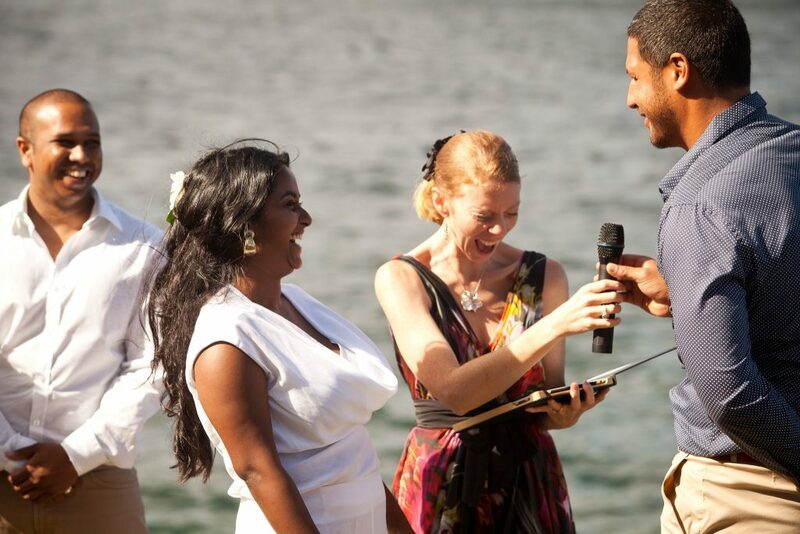 The ceremony itself was easy breezy and all we did was laugh. We all got drenched when a freak wave came crashing up behind us – and we copped the lot. Half my paperwork blew into the water. Still laughing. But this shot tells it all. This is the moment that I asked Sione – did he take Prashani as his wife la la la? Now most people just answer with I do – or I will – or sometimes just yes. But not Sione. He grabbed the mic from me – looked down at us all (he’s tall – Prashani and I are not tall) and yelled at the top of his lungs – Hell Yeah! Every year on their anniversary – they pop up on facebook – and I send them the same message. When I first met Ree and Vincent they were young, gorgeous uni students studying psychology. So I gave them homework. They did their q&a’s – and pored their way through my huge homework book – and Vincent got very, very excited. He read in it about an old Pagan tradition of newlyweds jumping over a broom, celebrating the leap into a new life. Vincent was so excited. That was the only part he would not negotiate on. It was going to happen at their wedding. Ree was more than a little confused. What was so exciting about jumping over a broom? Why was he so adamant that this was going to be the best part of their wedding? Vincent wouldn’t budge. He was insistent. It was going to happen. After much to-ing and fro-ing, it clicked. Vincent’s eyes were playing tricks on him. He was reading it as Jumping The Groom – not Jumping the Broom. The best part of this wedding ceremony was going to be him lying on the ground, while Ree – in her bridal gown – and her heels – jumped over him. 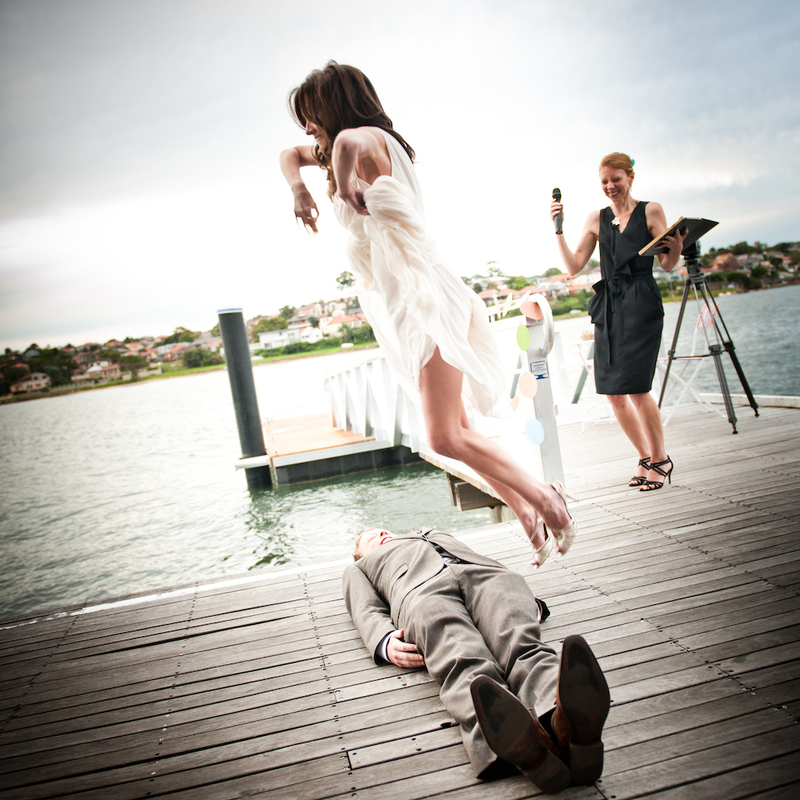 And so it was – like some sort of angelic, ethereal dementor, Ree hiked her skirt and leapt into the air – jumping over her groom, while we all held our breath and hoped she wouldn’t come crashing down, stabbing Vincent with her heels – or snapping an ankle as she came down. Back in my very first year – so long ago – was the wedding ceremony that wasn’t like anything I had prepared for – or studied for. I most certainly had never been a part of anything like it. Gina and Lee gave me very little to work with – but I thought I had it under control. It was to be only tiny – just five of us – at sunset at Watsons Bay – on the cliff face. I could handle it. I had no idea what was coming. We began without Gina and Lee, as our witnesses read the pages of a children’s book. When they were finished, we looked to the bush beside us and there were Gina, in a emerald green mini dress and Lee, bare chested, in shorts, on their hands and knees, crawling through the bush in a game of cat and mouse. When Lee eventually “caught” Gina, they came together and Lee began a fifteen minute chant of a traditional Native American prayer. Now, we were all crying. That was when I realised that no script would be adequate or fitting for such a wedding. I almost choked on having to say the monitum – it was absolutely the wrong thing to say – but absolutely necessary for legalities. I apologised – but I did what I had to do. We moved from one action to the next, from one piece of prose to the next. We took each other’s hands , crossed across our own bodies – and created a circle of love. The wind was howling, the sun was going down, we were all barefoot and Gina and Lee made their vows. Hands on each other’s hearts, head to head , they whispered their words to each other – while the rest of us stood and sobbed. We tied their hands in hand fasting. We all hugged. They kissed. It was the most romantic, most emotional and most unconventional wedding I have been witness to – and when it was done, they all stripped and went skinny dipping to celebrate! Laughing? Crying? Intrigued? Want me at your wedding too?